With the exception of two 12 day trips to Spain and three 48 hour visits back to the UK for minor surgery (and follow up) on my left eye, I consider myself immensely fortunate to have spent most of the period from mid June to mid November this year based in the Swiss Alps. For over twenty years our family has owned an apartment in the famous car free mountain village of Mürren which is only accessible by cable car or mountain railway, and I am indeed grateful to have a home high in such a spectacular location high in the mountains and facing the three spectacular giants that are synonymous with the Bernese Alps – the Eiger, Mönch and Jungfrau. This is without doubt my favourite part of the world and, after just a few days back in the UK, I miss it already and am looking forward to my return next year and the hikes that I already have planned for 2019. The mountain scenery of the Swiss Alps is almost without comparison – for me the high Himalaya of the Everest region and the Swiss Alps display the most magnificent and spectacular mountain scenery on the planet. 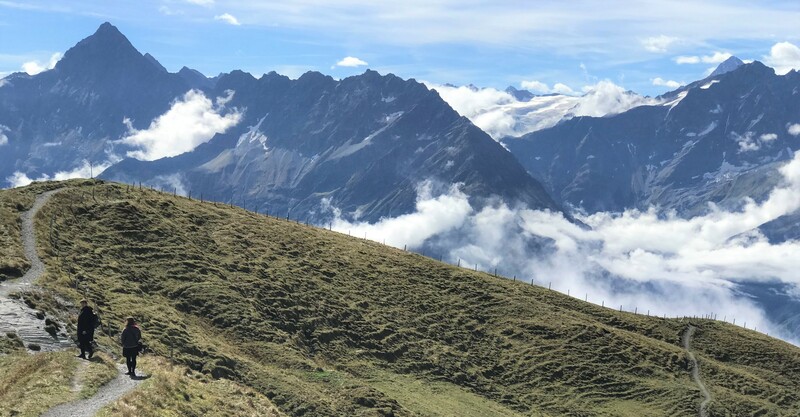 And I never ever take it for granted that I can leave the back entrance of our apartment building and, within minutes, be on a deserted trail and totally immersed in a world of Alpine pastures, valleys and peaks. 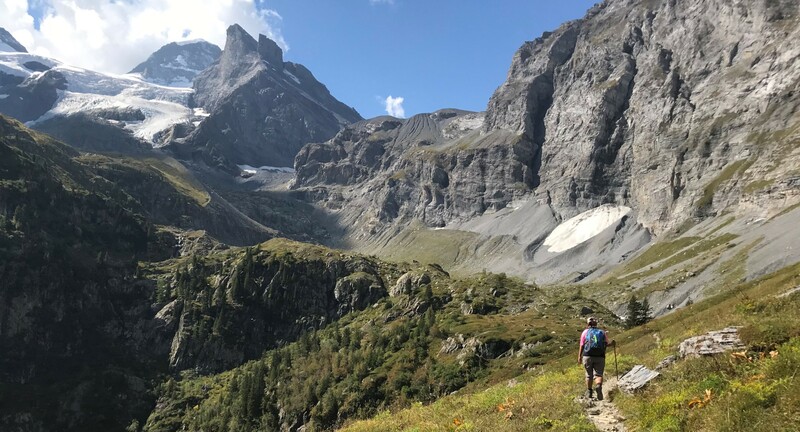 This year I managed to complete over 40 hikes ranging from two hours to over 10 hours in duration and, as well as hiking in my beloved Bernese Oberland, I also hiked in the Central Swiss Alps, the Valais and in the French Alps, close to Mt Blanc. As one gets older, it seems the trails get steeper and more exposed each year, but the reality is that I am in denial about getting older and will not accept that I am heavier, slower and less steady on my feet! However at least the magnificent scenery remains the same albeit with the glaciers in retreat. What follows is a selection of images I took of a range of Alpine panoramas that unfolded before me as I wandered along a variety of trails in the Alps this year and, at risk of appearing to be sacrilegious in the eyes of traditional photographers, can I admit that although I had a Rangefinder camera with me, every image that follows was taken by……………..an iphone 7+ which is far from the latest of these wonderful devices. It was not so many years ago that Landscape and Panorama photography required specialist equipment and/or a revolving tripod and indeed, in our apartment in Mürren, I have a book written not so long ago on Panorama Photography. And now, even before I have had time to read it, much of it is out of date, because as long as one understand the basics of composition, 95% of what once required specialist equipment, now just requires a Smartphone and an understanding of how to use it! It is indeed a rapidly changing world! I hope you enjoy the images that follow! And please let me know if you are ever near the Swiss Alps and fancy some easy walking amidst some breathtaking scenery! NB All the images are in the Swiss Alps unless described otherwise. Mürren is located on a small shelf high above the Lauterbrunnen Valley and can only be accessed by Cable Car and Mountain Railway. I never tire of the view of the Eiger (3970m), Mönch (4107m), Jungfrau (4158m) and so many other peaks from our balcony in Mürren. I genuinely consider it to be the finest view I have ever seen from a private dwelling and am forever grateful for the privilege of living here. The Lauterbrunnen Wall after an Autumn snowfall. Historic Barns in Mürren but today there is only one farm remaining. I truly consider it to be a privilege to be walking with such a spectacular backcloth as soon as I leave our building. 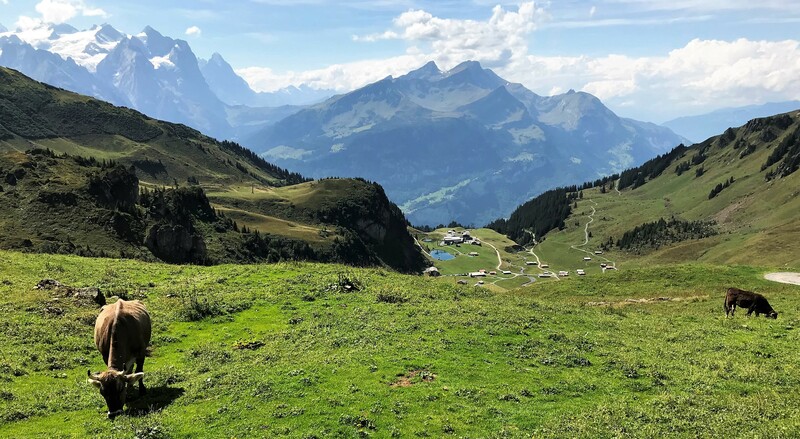 The Blumental Valley is just a 15-20 minute walk away above Mürren. The delightful Blumental valley is located just above Mürren in the Bernese Alps. Looking back towards Mürren from the Blumental the view is dominated by some of the most famous mountains in the Alps. From the left: The Eiger (3970m), Mönch (4107m), Jungfrau (4158m) dominating the view, Ebnefluh (3962m), Mittaghorn (3892m) and Grosshorn (3754m). It is easy to understand why these magnificent peaks on the east side of the Lauterbrunnen Valley are described as the Lauterbrunnen Wall. The Eiger (3970m), Mönch (4107m), and Jungfrau (4158m) from close to the Suppenalp Inn in the Blumental. Looking back at the Suppenalp Inn and the Blumental Valley. The Schilthorn is forever associated with James Bond (‘On her Majesty’s Secret Service’ was filmed here) and offers spectacular views in every direction. This is the more exposed trail up and down the popular Schilthorn (2970m), above Mürren in the Bernese Oberland. If you zoom in you will see hikers at the base and higher up you can see that the trail is assisted by ladders and cables. One can continue descending to Rote Hard and then cross the Chilchfluepass to access the rarely visited Saustal Valley which is seen to the left of the ridge behind the Schilthorn. This makes a (very!) full days excursion. The pyramid shaped peak in sunlight along the ridge behind the Schilthorn is the Bietenhorn (2756m), an easy if tiring hike that I completed for the third time in recent years in August. Looking down towards the Rotstock Hut at the base of the Schilthorn (2970m) from the Rote Hard Pass. The high peaks in the background comprise the Lauterbrunnen ‘Wall’ and are all close to 4000 metres and the main peaks from left to right are the Ebnefluh (3962m), Mittaghorn (3892m) , Grosshorn (3754m). and Breithorn (3780m). The Rotstock Hut is an easy two hour walk from Mürren. West of Mürren: The Rotstock Hut The Rotstock Hut is a popular overnight stop both for hikers on the Alpine Pass Route that traverses Switzerland prior to crossing the Sefinenfurgge (Pass) and also for those planning to ascend the Schilthorn. It is about a two hour and 30 minute hike from Mürren. 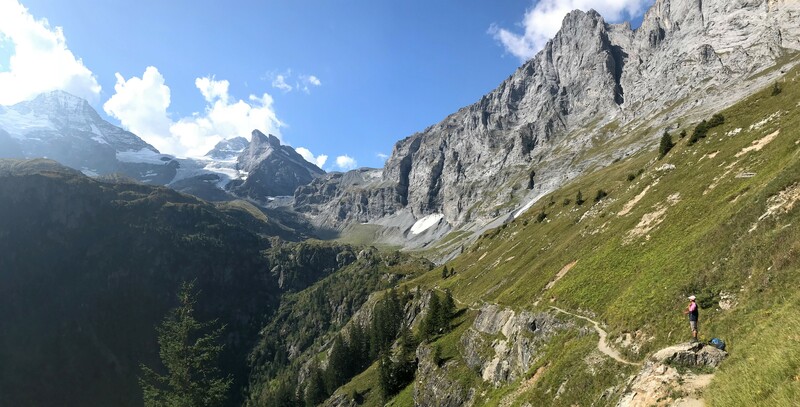 There are magnificent views of the Lauterbrunnen Wall from the trail to the Rotstock Hut with the distinctive profile of the Eiger (3970m) far left. 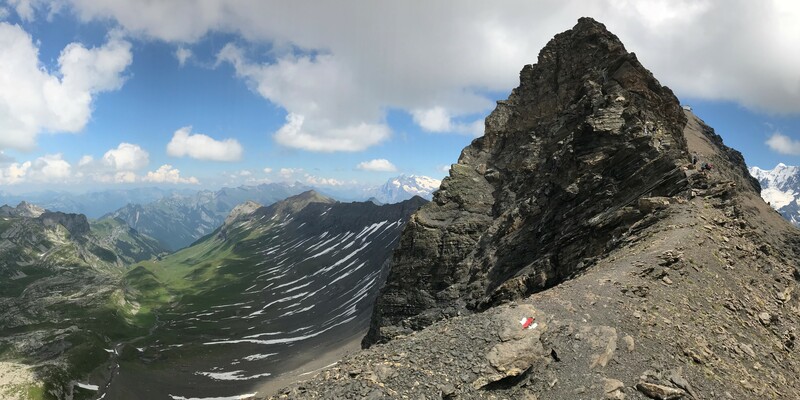 In 2009, our daughter Lisa climbed the Mönch (4107m) next to the Eiger and she and I have both climbed the snowy Ebnefluh (3962m) at the centre of the image. Hikers heading towards the Rotstock Hut and the Sefinenfurgge Pass, the lowest point on the horizon. Looking across the Sefinental Valley towards the Gspaltenhorn (3436m with snow) and Butlasse (3193m free of snow) both right of centre from the trail between Mürren and the Rotstock Hut. The Sefinental and Tanzbodoli The route from Mürren to Obersteinberg in the upper Lauterbrunnen Valley via Tanzbodoli is one of my favourite hikes. So much so that I have completed this long day 18 times in the past 25 years! Descending into the Sefinental Valley from the Rotstock Hut. Tanzbodoli is the small almost flat plateau to the left of the Spitzhorn (2210m just left of centre). It is a very steep 800m two hour hike up from the Sefinental Valley to Tanzbodoli but I have included it on 13 of the 18 occasions I have hiked to Obersteinberg since 1993. In my opinion Tanzbodoli is one of the great viewpoints in the Alps. And after the 8oo metre climb and final scramble it is in order for hikers to relax and appreciate the unsurpassed 360 degree views. 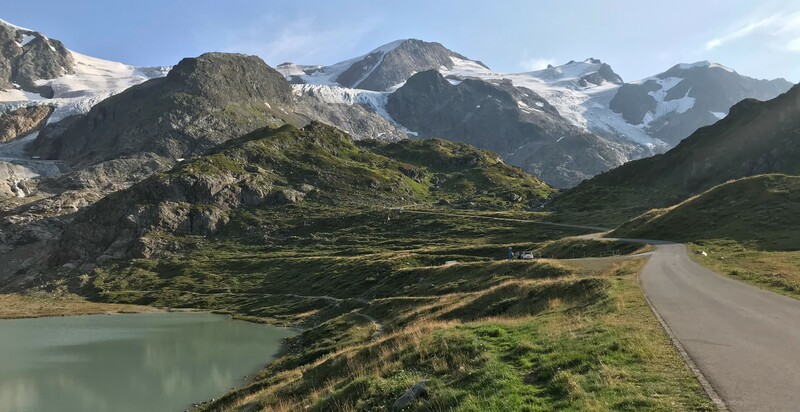 This view is dominated by the Breithorn (3780m left) and Tschingelhorn (3562m right) The Schmadri Hut (2262m) is another favourite destination for this writer and is located on the grassy area surrounded by a curved moraine on the left of the image. The Upper Lauterbrunnen Valley is my favourite hiking destination in the Alps. The Inn at Obersteinberg is a two hour hike from the closest road at Stechelberg. It is my favourite hotel in the world and I try and stay there at least once each year. Admiring the view on the spectacular trail between Obersteinberg and Oberhornsee. It tales about 70 minutes to hike from Obersteinberg to Oberhornsee. Oberhornsee is a popular three hour hike from the small hamlet of Stechelberg in the Bernese Oberland. Alternatively stay overnight at Obersteinberg Inn and make it a grand two day excursion and include a visit to the Schmadri Hut. 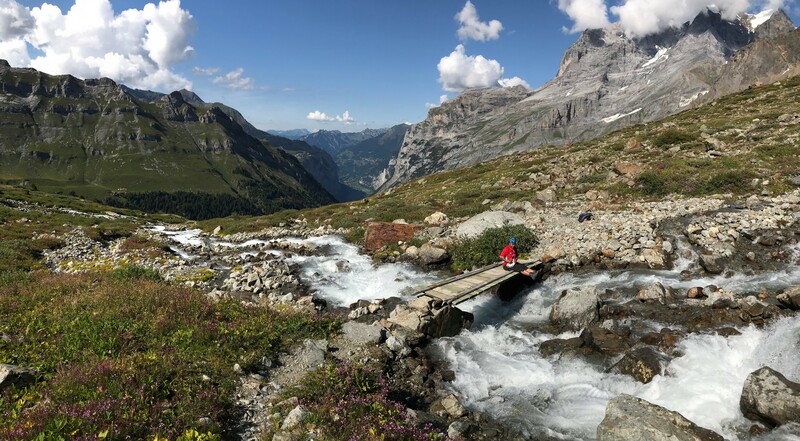 The 70 minute hike from Oberhornsee to the Schmadri Hut is an absolute delight of which I never tire – despite the five hours of walking it takes to reach the area from my home. The view is dominated by the mighty Jungfrau (4158m). Looking towards the Gspaltenhorn (3436m) from the Schmadri Hut. Same view. A different day and different colours! Exploring one of the ridges surrounding the Schmadri Hut with the Grosshorn (3754m)above. Having scrambled up onto this ridge above the Schmadri Hut I could look back towards my home in Mürren. Evening at the Schmadi Hut (2) Last time we slept here war broke out between excitable Spanish hikers and a taciturn Swiss group! Thankfully this time we had it to ourselves. Looking past the Breithorn (3780m) and Tschingelhorn (3562m) towards the Tschingelfirn glacier from the Schmadri Hut. I hiked up the glacier to the Petersgrat Ice field with a Swiss mountain Guide in 2009. A cold dawn found me on another moraine above the Schmadri Hut admiring the view of the beautiful Breithorn (3780m). Hiker at rest below the Schmadri Hut – and on a video chat to Thailand! The world is truly a global village today. The ever changing mouth of the Breithorn Glacier is always worth the short detour from the trail. It is a grueling 1350m descent from the Schmadri Hut to Stechelberg, so breaks are always welcome! Ballehochst and the Saxettal Valley is located between Mürren and the main town of Interlaken. A lone hiker approaches the viewpoint of Ballehochst (1955m) above Interlaken after a three hour hike from Sulwald or two hours from the Lobhorn Hut. You can identify the trail contouring across around the scree slopes of the Sulegg on the left and the Saxettal Valley is on the right. The viewpoint of Ballehochst (1955m) has recently gained the addition of a cross (!) and affords magnificent views over Lake Brienz and up the Lutschental Valley towards Grindelwald. The head of the Saxettal Valley in the Swiss Bernese Oberland. In 1999 21 young travelers tragically lost their lives in a flash flood after heavy rainfall when boulder hopping lower down the valley. The Jungfraujoch is the location for Europe’s highest ( and most expensive!) Railway station. The Jungfrau (4158m) from the trail to the Mönchjoch Hut (3629m). Our daughter Lisa climbed the Mönch (4107m) nine years ago. The railway to Europe’s highest station at the Jungfraujoch (3454m) gives immediate access to the snow and ice environment of the high Alps. Evening at the Jungfrau (4158m). High Altitude Piss before he paraglided away! The famous railway station at Kleine Scheidegg (2064m) with the Mönch (4107m left) and Jungfrau (4158m right) behind. Haslital. The Haslital, east of Meiringen, is an area I have always been keen to explore further and this year I managed several hikes in the area. The Haslital area above Meiringen is easily accessed by cable car to the Alpen Tower (2233m) and provides many easy walking options. The Cable Car to the Alpen Tower provides access to spectacular views and easy walking. Looking down at Magisalp from the trail that links the Alpen Tower with Kaserstatt. Descending to the Talli Hut from the Satteli. Looking across the Gental Valley towards the Satteli Pass from the Alpen Tower to Engstligenalp trail. Above the clouds and the Gental Valley between the Alpen Tower and Engstligenalp with the Bernese Alps as a backcloth. Our destination of Engstligenalp and the Engstlensee has finally come into view. 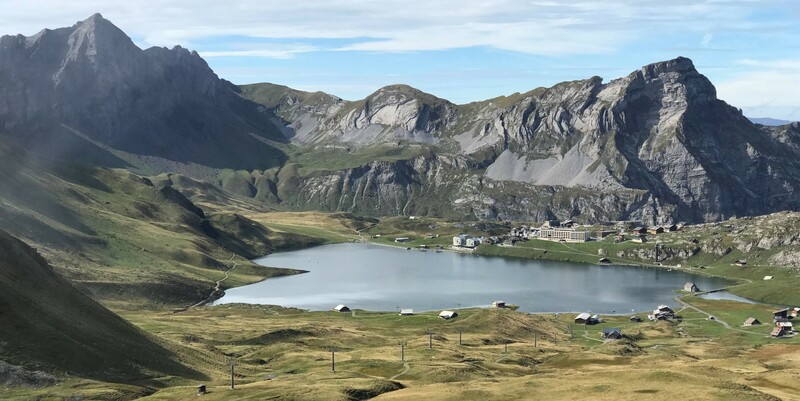 Melchsee Frutt is one of the lesser known Alpine resorts. There are many easy walks around the Tannensee and the small settlement at Tannalp. Meiringen from the Reichenbach Falls, forever associated with Sherlock Holmes as the location of his fictional death. Looking down at the Steinsee from the Susten Pass road. This private road adjacent to the Steinsee provides access to the trail to the Tierbergli hut. The Gelmersee is worth a visit if for no other reason than to experience the Gelmerbahn – a rail link that is steeper than a Roller Coaster. There is an easy two hour walk around the Gelmersee, close to the Grimsel Pass. The Gelmersee is always worth a visit even in overcast conditions! The Gelmer Hut is located close to the waterfall just left of centre. The Goschenertal (Central Swiss Alps). The Goscheneralpsee looking towards the Dammastock (3630m). Looking towards the Goscheneralpsee and Dammastock (3630m).from the trail to the Bergsee Hut. Autumn colours looking towards the Dammastock (3630m). Looking down on the Goscheneralpse from the trail to the Bergsee Hut. The delightful Chelenalptal valley looking east towards the Goscheneralpsee. The Chelenalptal Valley looking west towards the receding Chelen Glacier with two hikers taking a break before ascending to the Chelenalp Hut. An visit to Montreux for several concerts at the famous Jazz Festival is an annual indulgence that I always enjoy. Lac des Dix in the Valais was formed by the construction of the Grand Dixence Dam. Above the Chamonix Valley, France. Hikers heading towards Lac Blanc from L’Index in the Mt Blanc area, France. Looking down over the Cheserys Lakes in the Mt Blanc area, France. The retreating Argentiere glacier is in the background right of centre. Lone hiker high above the Chamonix Valley France. Autumn: To the North of Mürren I try and walk in this area at least once a week when I am in Mürren as it is so close and accessible. It is less than a 30 minute walk from the back door of our building to the peaceful alp at Mittelberg. Looking towards Oberberg from Mittelberg after some Autumnal snow. Looking back at Mittelberg and the Mannlichen Ridge from the trail to Oberberg. Looking across at the Lauberhorn (Right – 2472M) and Tschuggen (Left – 2520m) from near Grutschap. A few days before this image was taken I hiked up the Lauberhorn for the first time and admired the spectacular vistas. A mountain railway over 100 years old connects Mürren with the cable car at Grutschap. The Eiger (Ogre) Mönch (Monk) and Jungfrau (Virgin). According to legend the Monk in the centre is protecting the Young Virgin (right) from the evil ogre on the right! 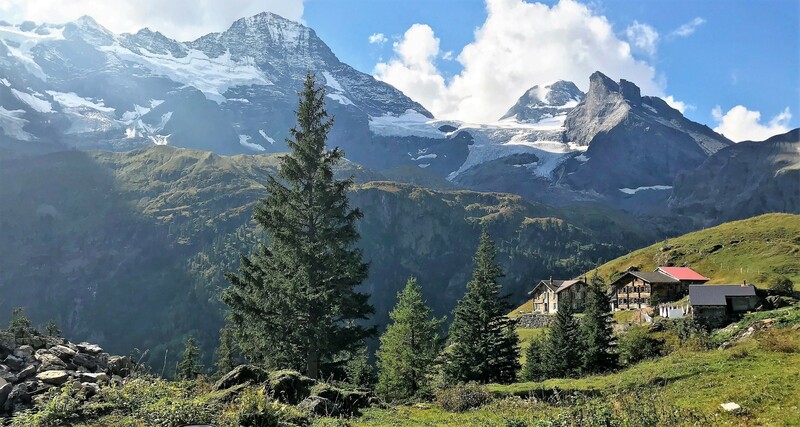 These three peaks are in many ways the face and enduring image that characterizes the Bernese Oberland. Autumn: The Schiltall The Schiltall below the Schilthorn is the other area I try and hike to every week as it is only an hours walk away. Approaching the Schiltall Valley with the viewpoint of Bryndli (2133m) ahead and the Gspaltenhorn (3436m) in the distance. The Schlitall Valley with the inn at Spielbodenalp on the left with Bryndli (2133m) above. The valley takes its name from the Schilthorn (2970m) just right of centre. Magnificent text and photographs of the wonderful Bernese Oberland! Superb, Michael, you could make this post into a booklet or photo-book. Very much appreciated. Michael, you are such an inspiration! The photos are magnificent, and your lifestyle enviable. We have started our own nomadic journey, having sold our house and now living off suitcases. We will draw courage from all your world travels.